The Bohemians re-enact the glory days of Queen including the Craziness of the 70’s and the Magic of the 80’s. A Comprehensive re-enactment of Queens Greatest Hits! 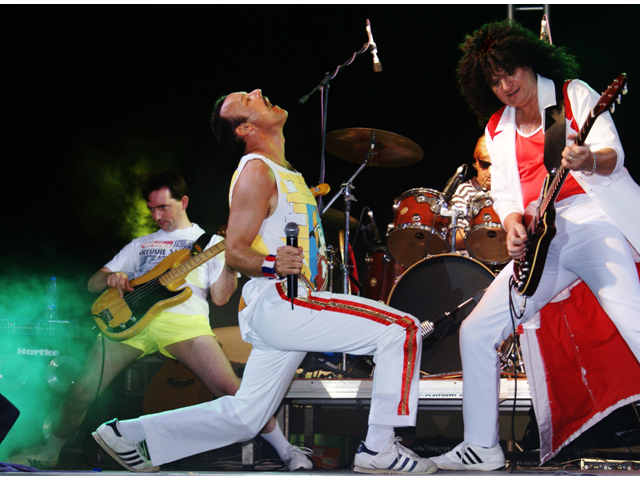 Internationally renowned Queen Tribute band The Bohemians take you on a high energy roller coaster ride of a concert, featuring the back catalogue of one of the world’s most popular and iconic rock acts of all time. So many fabulous hits to be covered but they’re all here, from the early piano and harmony heavy masterpieces , to the later, catchy pop of the eighties and Rock anthems of the early nineties. Whether it’s Killer Queen, Crazy Little Thing Called Love or The Show Must Go On, Bohemian Rhapsody or Will Rock You/We Are the Champions, The Bohemians will have you on your feet, singing, dancing and clapping along in a truly memorable live re-enactment of the world’s greatest Rock Band. For further information on The Bohemians or other tribute bands for hire, please contact the booking team.